The history of Catholic Education in Rock Island (population 39.684) begins with the missionary voyages of Fr. John George Alleman, O.P., a priest who traveled throughout that area of the Mississippi River Valley, establishing congregations and schools. The current Catholic High School in Rock Island, named in his honor, was established in 1949. In the early 1840's Fr. 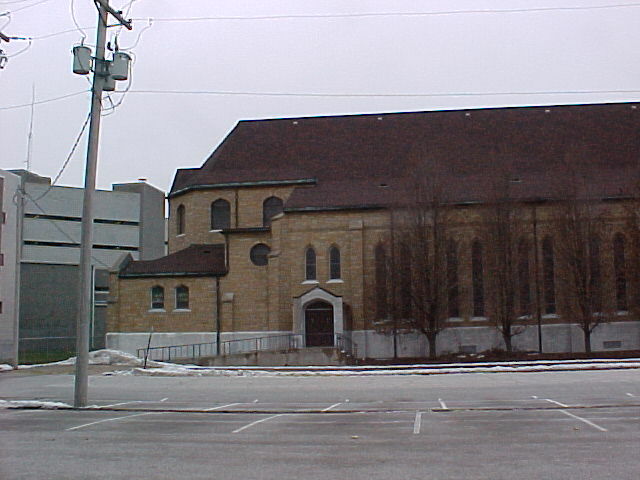 Alleman established a German speaking congregation at Rock Island, called St. Mary's. More than a century before Polka Masses, the parish's first Masses were said at the Beierlein's Cooper Shop, which manufactured beer barrels for Rock Island's burgeoning brewery industry. Mr. Beierlein was a devout Lutheran, but cleared his warehouse for Mass each Sunday until a Church building was arranged. The first division was made in the congregation in 1874, when a parish for the English speaking members was established, called St. Joseph's. The English speaking had been served with their own Mass beginning in 1867; this formed the core of the new St. Joseph Parish. The school seems to have begun by 1877. The first school building, including grade and high schools, was built about 1885. The founding pastor, Fr. Rolls, was succeeded by the pastor who was known for building up the parish and the school in the early years, Very Rev. Thomas Mackin. Fr. Mackin, born in Ireland, had been educated for a term at Notre Dame, and then completed his education at Georgetown University. According to "The Catholic History of the Tri-Cities" (c. 1905), Fr. Mackin "acquired his classical training, graduating in 1871 at the head of his class. His diploma was conferred upon him by Gen. William Tecumseh Sherman." The university later conferred upon him the degree of "Master of Arts" and he completed his studies for priesthood at St. Mary's Seminary, Baltimore. With his classical education, he was able to guide the establishment of a fine school with high standards. A man of culture, Fr. Mackin was also a man of fun. The Rock Island Argus, March 18, 1878, reports the St. Patrick's Day celebrations, centered around St. Joseph's, included a parade, which crossed the Mississippi River between Illinois and Iowa, an "eloquent address" by Fr. Mackin, a play, "presented by the Emerald Dramatic Society," and a "Grand Ball," attended by 80 couples. Over the decades, the St. Patrick's Day celebration included the participation of many High School students, and the day was grandly celebrated throughout the school. Performances such as concerts, plays, and minstrel shows were presented by the students in celebration of St. Patrick. The Very Reverend Dean Thomas Mackin remained pastor and guided the parish and school until his death in 1905. The Argus eulogized that "he was a man whose range of worldly knowledge was wide to an extraordinary degree... he had a statewide reputation as an orator... all admired him for his intellectual qualities, respected him for his religious zeal and loved him for his kindly and sympathetic nature." He was buried at Leland, Illinois. The presence of the Sisters of Charity of the Blessed Virgin Mary (B.V.M. Sisters) whose Motherhouse was in Dubuque, Iowa, was an established fact already in 1877. The B.V.M. sisters continued to teach at the high school until it closed in 1949. It should be noted that in 1869 two B.V.M. Sisters had come to Rock Island to establish a school for the English speaking, but they returned to Dubuque because of a shortage of sisters. By 1899 the school had 300 students. The school endeavored to form students in academics, certainly, but also through human and spiritual formation. At a Confirmation ceremony, November 4, 1906, the "boys all took the total abstinence pledge to abstain from the use of intoxicants until they reach the age of 21." This was a common practice in Irish parishes of the time. In a parish census of 1910, 150 boys and 160 girls were counted as attending the school. Although boys and girls shared the same school buildings, their instruction was carried out in separate classrooms, in accord with the widespread practice of the time. The School Building which many people today would remember as the "old school." was built in 1913. 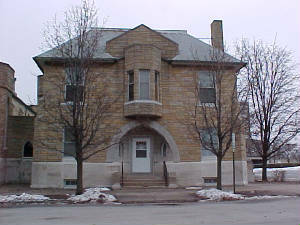 In 1920 a mansion was purchased and convered into a convent, with room for a roller skating rink for the students in the basement, in 1957 this mansion was sold to the Tri City Jewish Center for use as a synagogue, and it remains a historically significant building today. In 1926, total enrollment was 571 students, and in 1948, there were 689 pupils enrolled. Separate enrollments of the High School and Grade School are not listed, but the schools were conducted in separate buildings. The class of '22 picture shows 21 of the graduates, that of 1924 shows 17 of the graduates, and that of '47 shows, coincidentally, 47 graduates. It is unknown whether each graduate, every year, sat for a formal portrait in order to appear in the class picture. The quake of November 12, 1934 at 2:45 p.m. caused some damage. According to the website, the data on the quake was "4.0M Intensity VI" centered "Near Rock Island, Illinois ( 41.5N 90.5W )" The site continues: "In Rock Island and Moline, Ill., and Davenport, Iowa, bricks fell from a few chimneys and pendulum clocks stopped. In Rock Island, a stucco cornice was dislodged from St. Joseph's School; some loose plaster was shaken from ceilings in the men's dormitory at Augustana College, and loose bricks were shaken from a few buildings." St. Joseph High School continued until 1949, when its student population was combined with that of St. Mary's High School, Moline, to form the new Alleman Catholic High School, which began classes in the Fall of 1949 at its Rock Island Campus. When the school began, there was some worry that there would be too much tension between those coming from St. Mary's and those attending from St. Joseph's, since the schools had been strong rivals. There was, indeed, some friction, but new friendships were formed, old rivalries were buried, and the students united under the green and white of the Alleman Pioneers so that new traditions were begun, many of which continue until today. 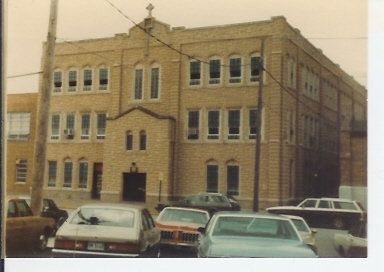 St. Joseph's Grade School continued at the site until 1974, when it combined with St. Pius and Sacred Heart Schools, Rock Island, and St. Ambrose School, Milan, to form the new consolidated Jordan Grade School, named for Monsignor Thomas Jordan, longtime pastor in Rock Island. The school was used for the Junior High of the consolidated school. The noise of students continued to be heard in this same building until the late 1980's, when the school property was sold to Rock Island County for the building of a new jail. The parish itself was closed in June, 2005, when the 130 year old church building was declared structurally unsound and irreparable. "It is impossible for persons who are under 55 years of age to have known a wise and saintly pastor of St. Joseph's Church by the name of Msgr. Patrick Durkin. I am among many hundreds of Sacred Heart parishioners who, for several decades, were cordially welcomed as students of St. Joseph's High School by Msgr. Durkin and the BVM Sisters who were our teachers. "Our high school years were filled with countless treasured memories thanks to the equally countless sacrifices by St. Joseph's Parish to make our high school education possible..."
"In the meantime, all of us can pray often and fervently that the agony of "letting go" will become less and less painful for the members of St. Joseph Parish. We can pray especially for the quality of courage and patience and endurance that was required of those valiant pioneers of the 1800s who established settlements in our neighborhood that were identified as "Farnamsville" and "Stephenson" before becoming known as the city of Rock Island in the state of Illinois. "These pioneers had left comfortable homes and relatives and friends in Europe and in the original colonies of our nation in order to explore and settle in the western regions of our territory. These pioneers knew from this experience the agonizing pain of "letting go." The purple and gold of St. Joseph's High School was well known on the athletic fields of competition. The boys were well known for many basketball and football triumphs. 1917 featured a Champion Senior Boys Football Squad. One notable loss of St. Joseph's High School football took place in East Moline. The East Moline High School "Hilltoppers" dedicated their new athletic field, Soule Bowl, which continues in use today, on October 17, 1936, with a 7-6 loss to Kewanee. East Moline won its first game at the new stadium on October 24, 1936 against St. Joseph High School, triumphing 39-0. Many thanks to Dr. Clement Cunningham, M.D., who provided some information for this history, as well as the St. Joseph Centennial History, from which much of the information was gleaned. "We realize what a tremendous foundation for life we receieved from the BVM Sisters at St. Joseph. Many girls joined the order, as did my sister-in-law, Sister Janet McGonicgle. After attending St. Joseph School and Clark College in Dubuque, Iowa, she taught music (piano) for 55 years before retiring. After retiring she became ill and resided at Mother House in Dubuque. We visited there often and had lunch with Sister Mary Francel, who taught for years at St. Joseph. She lived to be 102 years old and said she buried eight priests (one of whom was my brother, Father Richard Moran) of which all were her former students. She could remember her former students clearly and was a delight to visit. She passed away in 2004 at the Mother House. As far as athletics I recall beating Rock Island High School by the score of 9 to 6 the first year we played them (1932). As a freshman I remember learning football from our coach, Father E. A. O'Connor. We also beat Rocky on New Years Day in 1934. We did not have much equipment. I remember running a track meet using my underwear as a track uniform at St. Ambrose High School (Davenport, Iowa), which was an all-boys school! I also had a total six concussions while playing football due to the thin leather helmets we wore. At St. Joseph we also participated in plays, apologetics, choir, and a host of other activities that made the times exciting. I met and dated my future wife Betty at St. Joseph and am happy to say we celebrated our 65th wedding anniversary together last October (2005). During our schooling we were reared under Fathers Mackin and Durkin. We were also fortunate to obtain Fathers Jordan, O'Connor, Callahan, and Casey." Msgr. P.H. Durkin (the P.H. is for Patrick Harry) is my husband's great-great-great uncle. We were thrilled to see such positive words about him. I will have you know my husband's name is Patrick and his father is Harry Durkin III. Three generations of Durkins were named after this uncle. If by any chance you have pictures that include him would you let me know or any other notes would be greatly appreciated." "My dad played quarterback ,the year they played Rock Island at Douglas park. St Joe beat the Rocks. It was the only time they played each other. He had a beautiful letter for playing football. It was a J & purple in color. He had a letter, no sweater, as nobody had any money. The letter was very pretty purple color.He did say there was a pool hall behind the school where they hung out." A Glory Days Thank You goes out to John Moran for sharing this information with us ! John also sent us an invitation to his 50th High school Reunion held in 1985 which we were unable to scan into the site. John, your memories are truly appreciated!